If there is one recurve bow sold today that takes advantage of the craftsmanship of the past and benefits of modern technologies, that should be the Grizzly from Bear Archery. The uncrowned king of recurve bows, it has been often called a legend or a work of art. In its simplicity, it makes a statement. It is no wonder that for more than 50 years since its latest design update in 1964, it hasn’t received any important improvements. Anyone who wants to learn how to shoot using an elegant, away from any run of the mill design, recurve bow, should try the Grizzly. What makes the Grizzly such a household name? Some would say the unparalleled durability. And they would be right. The attention to detail in how this recurve bow is constructed cannot easily be rivaled by many other companies making such items on the market. The handle section of the model is made through a very particular process that gives birth to something called Futurewood. You are probably familiar with the general construction of a recurve bow. The most used wood is maple, but, for the handle of its legendary model, Bear Archery uses a very particular approach. Through a unique manufacturing process, the wood used for the handle is pressurized until all the pores get filled. That creates a more robust, durable type of wood that will resist the test of time. That is why this part of the Grizzly doesn’t warp or crack even after years of use. There is a consequence of the filling process that makes each Grizzly unique. Since the pores are not all uniform, they will fill differently, and that is why the handle will have what is called birthmarks. When you purchase a Grizzly, you can rest assured that it is unique. Other details about the build are that maple is used for the limbs and that the grips are capped with fiberglass for more durability. 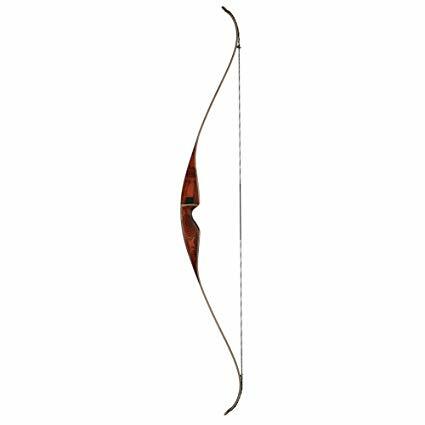 With a total length of 58 inches, this model is the ideal pick for many archers around the world. It does not come with a particularly fancy design, but its simplicity, as well as a few design elements surely make it stand out. For instance, the riser is custom-crafted, which means that its color may vary. It weighs only 3 pounds, so you will not feel that your arms are aching, even after an entire day spent shooting. The arrow shelf, however, is what truly makes a design statement, if there is one for this particular model. It is adorned with veritable bear hair, and the side plate is made of leather. You cannot go any more stylish than this, as far as hunting equipment goes. Besides the elements mentioned earlier, there are a few other features of the Grizzly that will surely convince you this is the recurve bow you should buy. For instance, the Flemish string it comes along with is made from Dacron, a superior material, that will not snap and break. As this is one major complaint of shooters in regards to other recurve bows than the Grizzly, that’s a feature to keep in mind. You will not have to assemble the bow, as it comes ready to shoot right outside the box. You will also love the fact that it comes with various accessories that work well, which means that you won’t have to pay extra for such items. 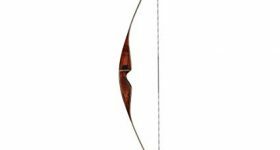 One of the most important advantages of this particular recurve bow is that it doesn’t make any noise and vibrations are almost non-existent. If you plan to sneak on your prey, be it elk or other large animals, when you are armed with this weapon, you will be as deadly as efficient. Game will not be able to sense you, and you will be able to get as close as possible to land a sure shot. The high quality of this bow is what recommends it most and foremost. As a beginner, you might not feel inclined to spend this kind of money on a recurve bow, but if you are serious about archery, there’s hardly a better pick on the market. Back in the 1970s, the Grizzly was the star of archery competitions, and it continues to offer the same precision and reliability that made it such a hit with shooters in the first place. Honing your skill is possible and even encouraged by the use of this bow.